Soup is one of those perfectly versatile foods—it makes a satisfying lunch, filling snack, or light dinner, and is especially welcome on a cold winter day. Nothing is more convenient than a can of soup, especially when you don't have the time or energy to cook. But store-bought canned soups can be laden with sodium, as well as calories and fat. And homemade soup is time-consuming to make and doesn't last that long in the refrigerator. Luckily, there is a way to preserve your homemade soup recipes by pressure canning them. So the next time you have the time and energy to cook a pot of soup, make extra and can a few jars of it for quick and easy future meals. Canning is also a great way to stock up on homemade broths. A pressure canner is a heavy piece of equipment that cooks the food at a higher temperature than boiling water. When canning vegetables that aren't pickled, you need to use a pressure canner versus a hot water bath; without the acid, the environment allows for bacteria growth. This small appliance is also useful when preserving soups. It is important to note that all soups, including vegetarian, must be pressure canned. You cannot safely can soup in a boiling water bath or else you risk botulism. This food safety rule applies to stocks and broths as well as soups with pieces of vegetables or meat. If you are canning a clear broth or stock—be it meat, fish, poultry, or vegetable—process pint jars at 10 pounds pressure for 20 minutes and 25 minutes for quarts. If you live at an altitude that is more than 1000 feet above sea level, adjust the canning pressure and time. Unfortunately, there is conflicting information about the safety of canning pureed soups at home. The solution to this uncertainty is to prepare the recipe for your pureed soup up to the step to puree it. Pressure can the soup in its un-pureed state, following the rule about using the longest canning time for the individual ingredients. All you have to do when you open the jar is heat and puree it before serving. That's not quite as convenient as if it were already pureed, but safety first! 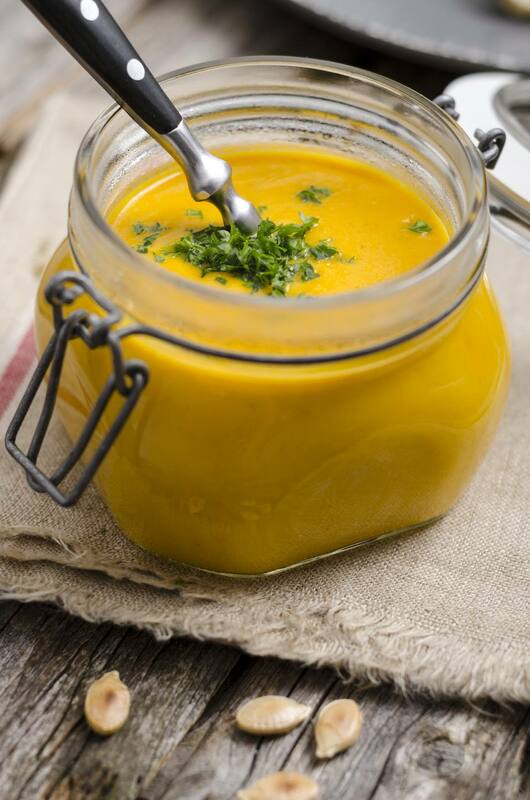 Or, if you really want to preserve a pureed soup in a heat-and-serve state, freeze it instead of canning it. Soups can range from brothy to chunky to creamy, and, depending on the recipe, may feature a wide range of ingredients. So when pressure canning, you need to keep a few things in mind before simply placing the finished soup in a jar. If you are using any dairy or thickeners, such as cornstarch, leave them out of the soup before canning as these ingredients don't stand up to pressure canning well. You can always add them when you are ready to heat and serve the soup. Also, if your soup has dry beans in it, they must be cooked before they are canned.